The 1963 Bazooka All-Time Greats Baseball Card Set includes 41 cards measuring 1 9/16" x 2 1/2". The front of the cards feature a black and white bust of the player, surrounded in a gold flake border. The back of the cards contain a yellow box at the top, with a short bio of the player below. The set was issued as inserts in boxes of Bazooka bubble gum. Every player featured in the 1963 Bazooka set is in the baseball hall-of-fame. 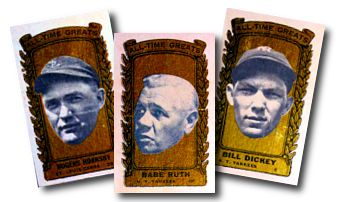 Some of the key hall-of-famers included in this set are: #6 Cy Young, #12 Walter Johnson, #15 Lou Gehrig, #17 Babe Ruth, #32 Rogers Hornsby and #35 Ty Cobb. CLICK HERE if you want to sell your 1963 Bazooka All-Time Greats Baseball Cards.